Neal Stephenson and friends fight for the future of ebooks with "The Mongoliad"
While the publishing industry fights to survive, a group of scifi writers and software developers have struck out on their own. Led by Neal Stephenson, author of Cryptonomicon, the group built an ebook that could make reading truly interactive. The project was born out of swordfighting. Stephenson, an avid swordfighter, practices this martial art with a small group in Seattle which includes software developer Jeremy Bornstein and others. Over time, and after a lot of input from martial arts experts, Stephenson realized that the descriptions of swordfighting in his novels would have been much better if they'd been shaped by knowledge contributed by people reading the books. And so the idea for a collectively written novel was born. With the help of authors Greg Bear, Nicole Galland, and Mark Teppo, along with Bornstein and others, Stephenson began to outline a book called The Mongoliad - a medieval adventure full of swordfighting and mysticism. [The Mongoliad is] about a time when Europe thought that the Mongol Horde was about to destroy their world, and the exploits of a small band of mystics and warriors as they attempt to turn the tide of history. And though I keep calling it a "book," The Mongoliad is actually an app written for mobile devices (currently iPhone and iPad). I had a chance to look at an early version of the book for iPad this week, and Bornstein walked me through its features. Below you can see a presentation Bornstein did recently where he showed the app interface. A series of clickable options run down the left side of the iPad screen, including access to chapters, movies, images, maps, and a "pedia" or glossary. The Mongoliad began as visual media, not text. "A year ago Neal said he had an idea for a movie and some of us got together and were writing a screenplay and the settling," Bornstein recalls. "The first part was set 200 years earlier than the [movie story], and that's what we're releasing as The Mongoliad. We aren't doing a movie because we don't have the skills to do that. Instead, we have software folks like myself, and everything we need to build this story." While Stephenson, Bear, and others worked on the text, Bornstein developed the app backend, focusing on collaborative software. The group dubbed the result the "personal ubiquitous literature platform," or PULP. Though interactive novels have had snippets of movies and images in them since the mid-1990s, PULP is what makes The Mongoliad stand out as a possible way forward for post-print publishing. PULP makes this book into something that's truly the product of our collective imaginations. When you're reading a chapter of the book, you always have the option to pull up a an interactive discussion window and leave a note or enter a discussion about the book. You can write your own additional storyline. Or add to the pedia to explain more about the historical setting. You can also rate every aspect of the book, rating any page on a scale of one to five stars. The Mongoliad isn't just a story; it's a platform for collaborative worldbuilding. The question is, how do you prevent such an endeavor from degenerating into chaos? "We have the concept of canonicity – if we like it we'll tag it as canon," Bornstein says. "We'll have ways of reflecting people's community standing in our forums. So some people will be able to help curate the canon, and we'll be the ultimate arbiters." The book will become a thicket of fanfic, but there will be a clear, canonical path marked through it by the creators of the story. So how will you buy The Mongoliad? It won't be like getting a traditional ebook, which is usually wrapped in some kind of format or digital restriction management software designed to prevent people from sharing it. Subutai is devoted to selling this book without DRM. You'll get it in an app store, and you'll pay what Bornstein calls "a relatively low price" for it as a six-month service, where you get new content every week. At the end of those six months you can renew for "a lower price." Bornstein hinted that the book will eventually contain "a few games too." "This is our solution to the ebook question," Bornstein adds. "You have to think of something else to do to get around copying. So you make it a service that people want to belong to and contribute to. So there are artistic and economic reasons for making it a service. [On the artistic side,] having the reader feedback we'll get good information about how the historical period worked." Stephenson, Bear, and the writers have about three months worth of text written so far. Some is edited, and some isn't. Once the book launches and people start contributing, Bornstein says, "We'll be willing to revise up to and after the publication. We're taking audience feedback really seriously - if people point out problems with fights we'll change it." 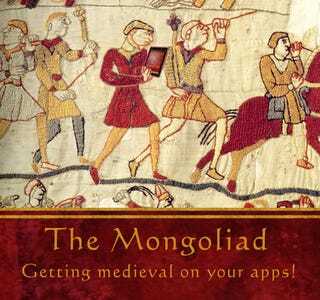 Ready to download The Mongoliad and get medieval? Subutai plans to launch before the end of the year. Sign up for updates on the project via their official website.